A popular Wiltshire rural visitor and educational attraction will soon be able to boast much-needed purpose-built cafe facilities thanks to a sponsorship boost from CSG.The River Bourne Community Farm – a not-for-profit, community-based project which has created a 1960s working farm for the Salisbury area – has gone from strength to strength since it opened in 2010. Volunteers created animal pens, paddocks and a classroom, while a shop was opened to sell the farm’s eggs and meat and other local produce. 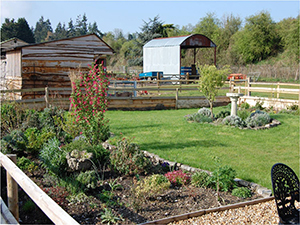 The farm’s first open day attracted 5000 visitors and within a year the facility was voted ‘Best Social Enterprise in Wiltshire.’ It later won ‘The Prince of Wales Award of Honour’ for the most outstanding contribution to improving the lives of the community. The farm now also offers vocational education for students from local schools keen to learn about farming, horticulture and the environment and is now an accredited provider of alternative education and a certified BTEC Centre. It also welcomes some 2000 primary school children each year on organised visits.Tens of thousands of visitors have arrived on the farm since its opening, and existing catering facilities – essentially housed in a portacabin and draughty outdoor tent– have become inadequate to meet the needs of the growing numbers. The farm organisers decided to build a “new warm and cosy community farm cafe to replace our current draughty facilities” and launched a successful appeal to raise £50,000.CSG has made a £22,000 contribution to the appeal via the Landfill Communities Fund – a scheme in which landfill site operators redistribute landfill tax to environmental and community projects in the area of the sites for which they are responsible. CSG operates its Pound Bottom landfill facility at Redlynch some eight miles from Salisbury. Farm Office Manager Jane Wilkinson said it was hoped to begin work on the new cafe in September.